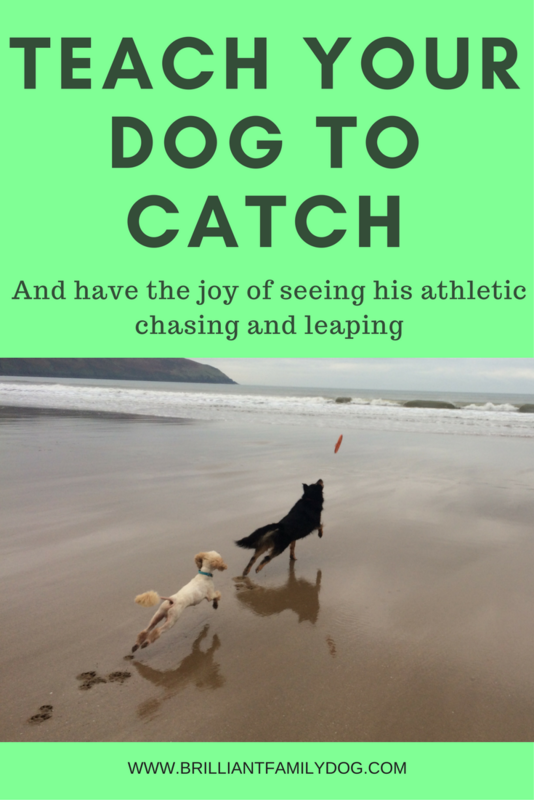 How to teach your dog to catch! My dogs are great catchers. I get great pleasure from watching their athleticism and joy. Sometimes people watching their frisbee acrobatics look sadly at their own dog and say “My dog is stupid - he can’t catch”. He’s not stupid - you just haven't taught him how to do it yet! Mine didn’t come with catching installed: this skill was carefully nurtured and developed. You’ll get a lot of entertainment from teaching your dog to catch - with a puppy it’s even more fun! And, of course, it’s a great way to use up lots of your dog’s energy - as long as you observe some safety rules. Puppies arrive on the planet with a mouth (and eyes) .. and that’s about the extent of their self-knowledge. Helping them discover where all their component parts are is an essential part of puppy-rearing. (This is why I feature “Puppy Gym” prominently in my puppy classes.) Learning that legs can move independently, that they can move sideways and backwards as well as forwards, that they can climb on and off things safely, and that they can land safely when they jump is key to their development. And you can add teaching your dog to catch to this list. Don’t start teaching catch too young with your pup. A very young pup (up to 10 weeks or so) doesn’t spot or focus on things very quickly. I’d wait till 16 weeks or thereabouts - and preferably once he knows lots of games featuring treat-rewards as well as chasing down toys. To teach him eye-mouth co-ordination, make it easy for him by always tossing your treat with the same arm movement. I favour the downward toss- i.e. you hold up your hand near your shoulder, wave it a bit to get pup’s attention, then slowly bring it downwards and release the treat so it loops down to the pup. Aim for the top of his muzzle, right where the nose leather begins. The more accurate your throws the faster he’ll get it. This is the entertaining bit! To begin with the treats will bounce off his muzzle and he’ll scramble to get them off the floor. Eventually his mouth will start to open as the treat comes through the air. And after a lot of practice at this, he’ll actually catch one! He’ll probably be more surprised than you and start hunting on the floor for it again, not realising it’s in his mouth! You can make it a lot easier for him by using treats that are clear to see - so little cubes of cheese are good. With one particularly slow-to-catch-on adult dog I used popcorn (plain, of course). And while corn should not generally form part of a dog’s diet, an exception can occasionally be made to get what you want. The popcorn worked for that dog because it’s huge, white, and floats down slowly. At this stage you could be feeding your dog’s whole dinner this way, one tossed piece of kibble at a time. Once your dog can catch a flying treat aimed carefully at his mouth, you can start tossing them at different angles. An adult dog (especially a greedy one!) will become quite athletic getting his treats. Take care that he’s on a firm footing, not a slippery floor. And build up slowly towards jumping. Now you’ve got the catch mastered, you can move up a gear and start teaching your dog to catch a frisbee. Jake showing his catching prowess on his 14th Birthday! You need a soft frisbee that is gentle on the mouth and teeth - one made for dogs. This is a good one. It’s soft on the mouth, easy to squash into a pocket, and floats beautifully in the air for controlled catching. Now using the same idea as with the cheese, you float the frisbee towards your dog who is right in front of you. So we’re talking about a couple of feet from hand to nose. No distance yet. After a lot of failed attempts he’ll be catching the frisbee expertly by the rim. If he’s not inclined to release the frisbee, or wants to run off with it, simply stand on his lead so he can’t, then swap it for a treat every time. Once he’s got that, you can change your reward from treat to instant throw. He’ll soon know that the routine of “catch then give” means you’ll throw it again immediately. So he’ll be anxious to hand it over straight away. Now start adding a little distance - maybe a yard to start with. And gradually grade up. As you increase the distance, you’ll build your own skill with the frisbee. A flick of the wrist is what’s needed to spin it, rather than brute force. And one of the reasons I like those soft cloth frisbees is because they’re so easy to spin and send over large distances. 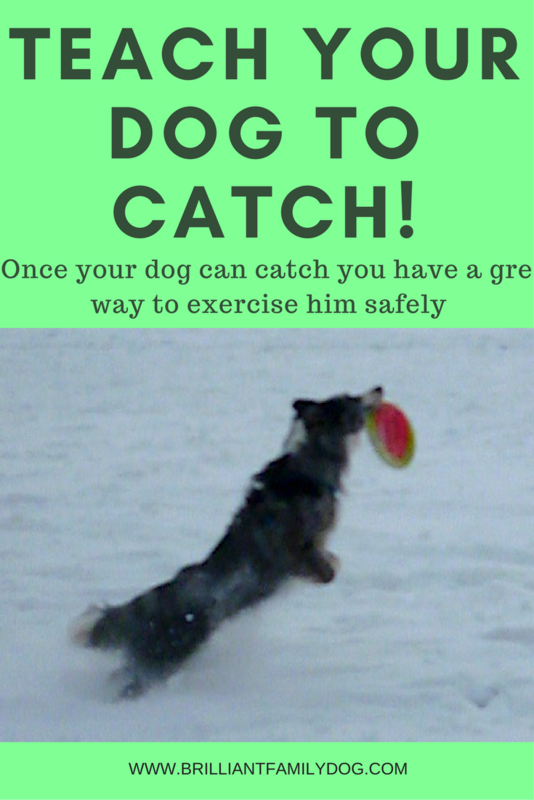 Now you have a way to exercise your dog safely while enjoying the sight of him flying after his frisbee and catching it expertly, bringing it straight back to you and pushing it into your hand - to throw again! There are dogs who do amazing antics catching their frisbee in competitions. But I have to say these images and videos make me very uneasy. The gyrations and hard landings look to me as if they’d take their toll pretty quickly on these dogs. I like to take life easier, and I aim to float the frisbee over the dog’s head, so that he can leap through an arc to catch it, landing comfortably and carrying on running. You’ll see in the photos illustrating this post that I look for fast running, an athletic leap, a soft landing - and I ensure that we’re not working on parched or frozen ground that would be too hard to land on. Remember this is another golden opportunity to teach some impulse control. Your dog will never get the frisbee by snatching it from your hand, or leaping up to mug you for it. He has to wait while you prepare to throw. You may want him to sit and wait, lie down and wait, or you may be happy for him to hurtle out twenty yards in the direction you’re about to throw it. Similarly, when you put out your hand for the frisbee to be delivered, it should be pushed into your hand - and not snatched away again! Also on safety - don’t use sticks! The only time I’d use a stick is if the dogs are in the pond and I know I can throw it far enough for it to be floating in the water by the time they reach it. 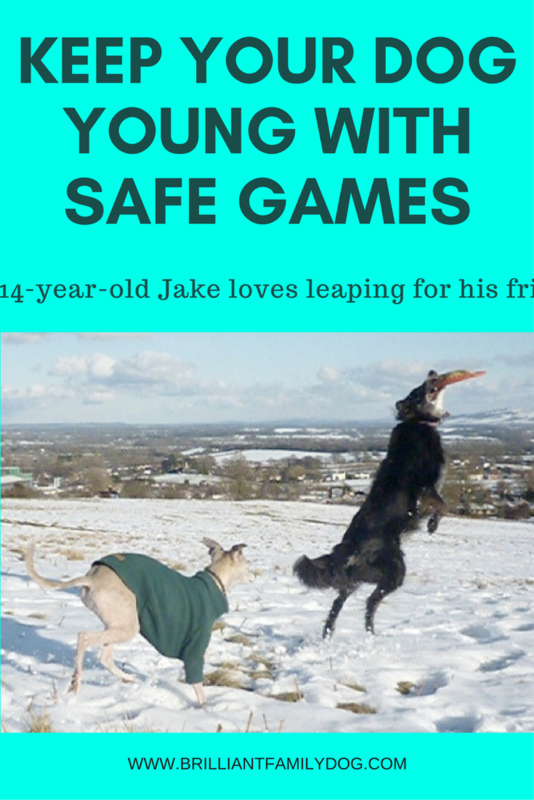 Dreadful injuries happen (sadly quite frequently) to dogs who catch sticks in the air or on the bounce. The stick wedges itself against the ground and can impale the speeding dog with horrible results. So if you absolutely must throw a stick, ensure that it will land and be still long before your dog can reach it. There’s never a collision or scrap over possession of the toy. They only go for their own toys. While my two older dogs will carry their frisbee for the entire walk without losing it, the two younger ones can get distracted and drop it somewhere. So teaching a search is also useful so that they find it instead of me spending ages looking for it. Rollo the Border Collie is brilliant at finding toys, and will lie down next to one (while his own is firmly clamped in his mouth) until it’s restored to its owner. Another supreme virtue of the dogs loving their frisbee: I can distract them very easily from incoming dogs to avoid confrontations. So if you have a reactive or growly dog, get him mad about retrieving as soon as possible! So if you don’t as yet have a catching dog, get started teaching him this skill today. Enjoy!